Garden of Victory Ibadan, Old Ife Road, Ibadan, Oyo State. Training of all members of Christ Life Church International all across the world. 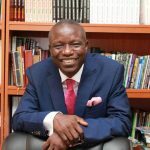 Teaching series by our Father in the Lord, Bishop Francis Wale Oke.